When the floor of the present church of Sant’ Andrea collapsed in 1926, the remains of a much earlier church were discovered below it. Investigations carried out (somewhat unscientifically) in 1927-9 uncovered almost all of the floor of this church, which was probably built soon after Orvieto was repopulated in the 6th century. Steps to the right of the side entrance to the present church lead down to the excavated area, which can be by appointment (see below). ✴The ceramic fragments found here that belonged to the Villanovan period (9th century BC) are now exhibited in the Museo Archeologico. ✴The remains of two roads and a number of monumental buildings outside the area of the paleochristian church date to the 6th century BC, and suggest that this might have been close to the Etruscan forum. ✴A layer of rubble that separates the ancient layers of the excavation from those of the early Christian period probably relates to the destruction of Volsinii by the Romans in 264 BC. Traces of two paved roads have been unearthed, one near an Etruscan cistern to the right of the early church and the other behind its apse. The remains of at least two monumental buildings can also be seen, one that was probably circular and used for cult purposes and a second (behind the apse of the early church, in the upper right of this photograph) made from large tufa blocks. This church had a wide nave and two aisles, and culminated in a semi-circular apse. A large area of its mosaic pavement survives. The facade of this church and its left wall provided the foundations for its successor, which was longer and wider. Traces of coloured decoration survives on its facade. The graffiti on a nearby patch of plaster contains two crosses and a letter “rho”: this is probably a representation of “Chi Rho”, one of the earliest forms of Christogram. At least three tombs have been discovered under this floor, one of which still contains some of the bones of the deceased. Architectural fragments (9th century) found during the excavations probably came from liturgical furniture that was commissioned in a period of restoration. The present church was built above its predecessor, which (as noted above) provided foundations for its facade and left wall. Its foundation stone can be identified by the incision of a cross. The workmen building the new church inserted a furnace of casting its bells and a stone for grinding mortar in the floor of its predecessor. 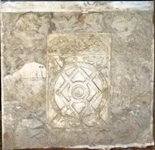 They decorated the obverse of reliefs from the earlier church in mosaic in the Cosmati style, probably for the pavement of the new church. Some panels of this sort are exhibited here, and others still serve as decoration of the pulpit of the church above. This archeological area is under the administration of the Soprintendenza per i Beni Archeologici dell’ Umbria, and I am grateful for their courtesy in allowing these photographs to be taken and published. I am also grateful to Dottore Francesco Pacelli, who provided my guided tour. Visits can be arranged with him or his colleagues at Discovery Orvieto on 0039 328 19 11 316. Return to Museums in Orvieto.